Why did at least 50 Korean people pass through the gates unmolested at Seoul Station to go on the KTX, but little old waegookin me gets picked out for bag X-ray and the wand treatment looking for weapons or sharp objects all to the horror of Koreans and small children lookng at the spectacle? Was it being non-Korean? Or has there been a spate of foreign attacks on the KTX? Somehow, I think it was the former; tw&ts!!! They do security checks at the KTX station? I've never noticed that, and I go through there pretty often. Lucky me, I guess. I remember back when I was in high-school I had my fair hair (badly) dyed in all sorts of colours, piercings, and was dressed in the height of grunge fashion. Needless to say, whenever I crossed a border I got the "random" security checks too. I'm not implying anything here, but I used to have a friend by the name of CJ, and... well... if you're him, they probably need to check you more often and more thoroughly. CJ is just something I pulled out of my rear. I dress better than your average Korean and wear a Swiss mechanical watch; I'm hardly a thug or undesirable in most countries that aren't suspicious of white men. Quote of the day? Guys? 쓋! Is it too late to submit an entry?! I'm not shitting on everyone. I wonder if she also flips out when she sees non-Koreans use chopsticks! I come back from lunch and find bleach spots on my t-shirt and pants. I'm not sure if it's from the school bathroom where the kids cleaned or the restaurant I ate at. It just makes me mad that this is a shirt and a pair of pants ruined!!!! 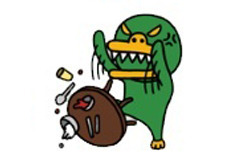 Today I'm angry with myself. 1 .Had a short conversation with a charming person (who will remain genderless) who started by listing their qualifications and saying they were more qualified than any NETs in Korea and how good they were at their job and how NETs weren't really needed in their classroom. What they missed about the NETs was getting all the creative lesson plans and speaking lessons the NET did. I SWEAR people don't think before they speak to me. I didn't say anything. I just stared at her. I can't help feeling I should've said something. I don't know what, I'm still trying to figure that out but I should've said something. I'm so angry because I didn't stop to think about the cardinal rule: don't give out any personal information. I didn't confront her afterwards either. She's a nice person but I should've said something. Went on a fifth date to play some badminton. All the nets were taken so we decided to play on the stonework that was next to the courts. Bad idea. I didn't think about how uneven it is. I jumped too high to get the birdie and landed on my right foot. OMG, Kevin! Are you ok? Jesus. Yeah, I've done this before. This one is 10% of that. Kevin, you are so passionate about what you do. I didn't say anything. I just stared at her. Don't worry, I'm sure the person's gender will remain forever unknown, kudos! I'm not in the swimming pool called Seoul but it's still enough to keep me inside and day drinking... Yay! I'm curious why her gender deserves (or doesn't deserve?) mentioning here...? First day back, and I have to teach 4 out of 5 periods as opposed to the 2 I was expecting. Non-Korean Flight attendant: Would you like the beef bibimbap or the chicken pasta? N-K FA: Here you go! Korean FA: sees me eating happily ISN"T THAT TOO SPICY FOR YOU?? I know it shouldn't make me rage so hard but that and the "oooohhh, you can use chopsticks so good!" nonsense are basically the only comments that really grate on my nerves here, plus it was a real nice reminder that vaca was over and I was heading back to the 대한민국! Might I* suggest a gender-neutral 리챔 gift set? *Who is ALL man, trust me! Whoa there, cowboy. They've threatened me with a tasering for less. On the other hand at least I got a sobbing laugh out of today. 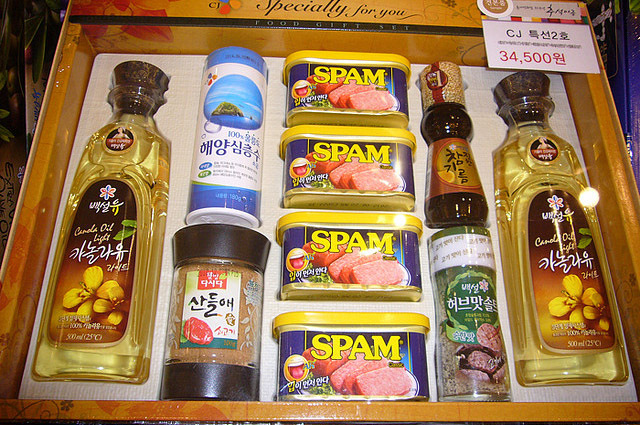 I recommend the genderless spam gift set. What's the deal with all of these little fruit flies? They swarm all over my garbage and come into the main room. I've blocked off the finger holes on the mesh screens, I put all organic rubbish in the freezer before I throw it out and I've sprayed the hell out of them yet they're still there the little f&$@*&s!! !